A true adventure story full of trains, explosives, sneaky tactics, spying, and dinosaurs! 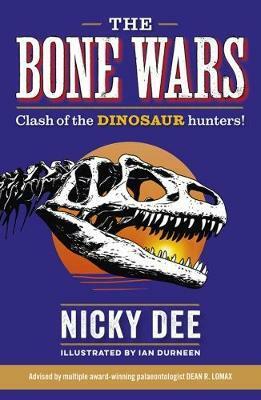 The Bone Wars tells the true story of the battle to be the most famous dinosaur hunter in the world! The "Great Dinosaur Rush" was an amazing time in U.S. history when the hunt for dinosaurs really began. Would the two gentlemen scientists who led the hunt play nicely and work together or would their desperation to be the best lead them to behave very, very badly? Told as a story for children for the very first time, the book is thoroughly engaging and factually correct, and will delight all budding paleontologists! Thoughtfully illustrated, it brings 19th-century America alive. Nicky Dee is the author of the What's So Special About? series of dinosaur books. Ian Durneen is an artist and illustrator. Dean R. Lomax is an award-winning paleontologist.